For a table exhibit at the Vintage Computer Festival in September I’ve built an ultrasonic ranger to show the 1802 hooking up to off-the-shelf modern components meant for an Arduino. 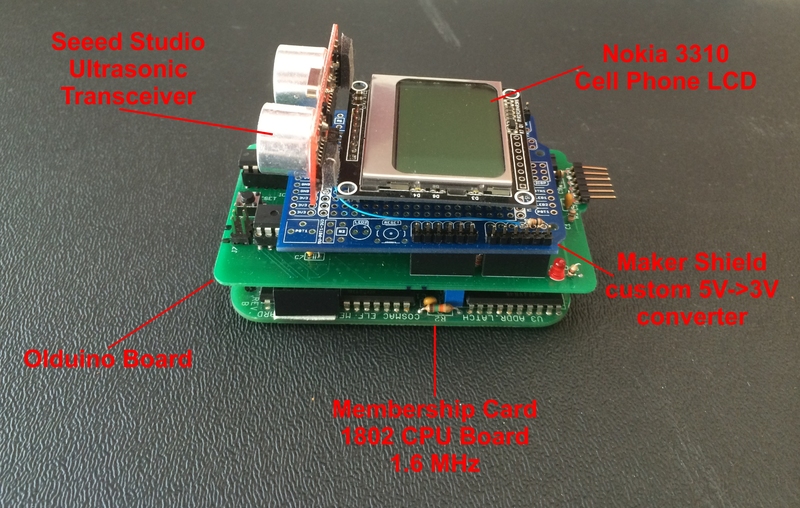 In this case, a Seeed Studio ultrasonic transceiver, a Nokia 3310 cellphone screen from Sparkfun all connected through a Maker Shield prototype board. The code works although I’m not crazy about it. I’ll include it here now for completeness and I’ll update it if it gets better. The main procedure initializes the LCD then enters a loop that displays one frame of animation and prints the distance reported by the pinger on the bottom line. The calculation (pinger()+3)/5 is converting the round-trip distancce in centimetres to inches with rounding. LcdString prints an ascii string and itoa converts the distance to an ascii string. The animone() routine does one frame of animation. The LCD’s 48 pixel height is divided into six lines of eight bits. The ship is on 3 of those lines so we don’t have to touch the others. The pinger routine is written in plain 1802 assembler and is simple enough although, of course, C makes everything ugly. 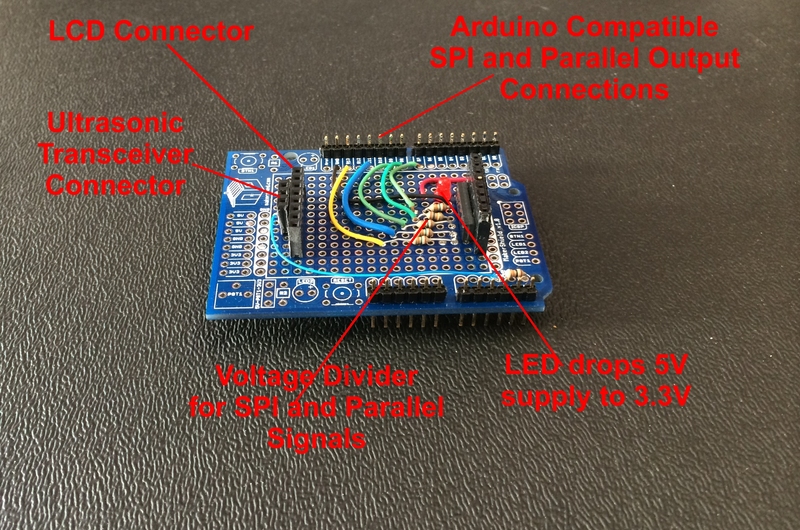 The preamble copies in the definitions for the basic olduino routines and standard library, the hardware spi routines the basic LCD routines and those needed for character display, and the bit pattern used to display the starship. The corresponding .c files are included at the bottom of the program. All of the code can be found on the LCC1802 downloads page and in the LCC1802 include and examples directory. Except for the assembly code it is often cribbed from arduino examples.